Wax(in') Blue is a juried exhibition featuring work from 25 encaustic artists from around the Midwest. The title refers to the color blue and all of its meanings. Each artist has approached this theme in their own way, resulting in an exhibition filled with different styles, techniques and new takes on the encaustic medium. 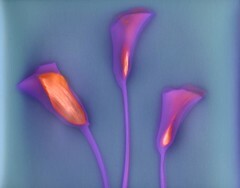 Vicki will have three images included in this juried show: lumen prints scanned and printed on silk with wax applied. Opening reception is Saturday, August 10, 6-9:30pm. Jurors: Kathleen Waterloo and Kathy Blankley.